Speakerphones are usually seen in board rooms, but GE's Premiere DECT 6.0 Phone with Home Intercom brings it to your kitchen. While speakerphones aren't new to home phones, they aren't usually that effective and often produce distant-sounding calls that are filled with echoes. According to GE, the larger acoustic chamber found on its Home Intercom provides a superior, cleaner sound. 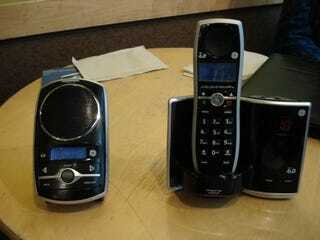 The phone and speakerphone also include DECT 6.0 technology, which operates on a dedicate frequency to eliminate interference from wireless networks throughout your home.